Food Costs > How Much Does Caviar Cost? How Much Does Caviar Cost? Caviar, globally known as a luxury food, holds the record as the world’s most expensive food. It’s the lightly salted, processed eggs of the sturgeon fish, commonly from the Beluga variety. Since Iran and Russia quit taking wild sturgeon from the Caspian sea, most caviar bought today will come from a farm. Although people associate all fish eggs as caviar, this isn’t true. The only true caviar will be harvested from the sturgeon. If it’s harvested from any different fish, it will be referred to as roe. As stated on our table of costs below, there are many species which produce a high-quality roe such as whitefish, trout and salmon. On average, caviar can cost anywhere from $50 to $3000 per ounce, depending on the species, the quality, rarity, time of year and geographical location. As noted above, a true caviar is harvested from a sturgeon and there are 26 species on the market, four of which are the most popular: the Beluga, Osetra, Sevruga and Sterlet. Refer to the table below for the most common species of caviar and roe, along with the price range. Alternatives, such as Sturgeon roe, the most common caviar found at local restaurants, and commonly listed as beluga caviar, can cost $200 to $300 per ounce. Another alternative — the Paddlefish — is a non-sturgeon and can start at $25 to $50 per ounce. According to the Food Republic, one of the most expensive caviar comes from a 60 to 100-year-old Iranian beluga sturgeon, which sold for close to $1,000 per ounce. Serious Eats says you should be prepared to spend $50 to $75 for one ounce (30 grams), but the prices can get astronomically high. Known as the Acipenser Schrencki, this caviar comes from the Amur River in China, and is known for its waxy-like shell/finish and unique flavor. Extremely rare, the Kaluga sturgeon, often referred to as the River Beluga, is closely related to its cousin, the Great Belusa. It’s extra large in size and will have a milder taste. This type was banned in 2014 in the United States and is no longer imported. Osetra is slightly smaller than the Beluga and can require up to 10 years before its mature and able to produce eggs. It offers a medium to large gain and can be lighter to dark in color. Also referred to as the White Sturgeon, this medium to larger sized eggs will have a lighter gray or charcoal colors, offering a milder flavor. This is the smallest of the Caspian caviar. Extremely fragile, this caviar will be medium to dark gray and is known to possess a strong quality. Also referred to as the Hackleback, the Shovelnose sturgeon is a smaller jet-black, budget-friendly caviar, rich in flavor. Originating from Baerii, this caviar has a deep black color and is small to medium in size. This is another budget-friendly caviar that offers an excellent flavor. The Sterlet sturgeon is similar to the Sevruga, but the size and appearance will be different, offering a cleaner finish. Caviar can come in two forms: pasteurized and unpasteurized. Pasteurizing will slow down the spoilage, similar to how it works with milk, but most food connoisseurs say it can affect the taste and texture. The eggs will be removed from the sturgeon and soaked in a salt water bring to help preserve the fragile eggs; it can also help enhance the flavors. There are no regulations when it comes to labeling caviar; however, many retailers may label as imperial, royal, presidential or prestige. As for quantities, some retailers may sell 1, 3.5 or 6.5-ounce containers, while others offer containers in grams. What color is caviar? Eggs can range from a gray to a lighter purple/blackish color, and the paler the color is, the higher the price can be since this determines how old the fish was. Even though it’s a cured fish, it can still be stored for up to two weeks in a refrigerator as long as it remains chilled. However, it’s always best to consume as soon as possible once the tin is opened. Caviar is high in cholesterol and salt. One tablespoon is known to have 42 calories, close to three grams of fat and 250 mg of sodium. Experts recommend using a pearl or bone spoon instead of metal to preserve the flavor. Since 2005, Beluga caviar has been illegal in the United States since it’s deemed an endangered species. This is considered as one in high demand since it can live for more than 150 years and weigh close to one ton. Those who have tried it note it for its subtle, buttery and salty taste, while others say a higher quality caviar should never taste salty. Like a fine wine, the taste of caviar will depend on the region it comes from. If purchasing local, insist that you’re able to sample it from the tin you’re buying. That way, you know exactly what you’re getting yourself into. Also, be careful when buying caviar online and always research who you’re buying from before doing so. If the prices sound too good to be true, then it probably is. 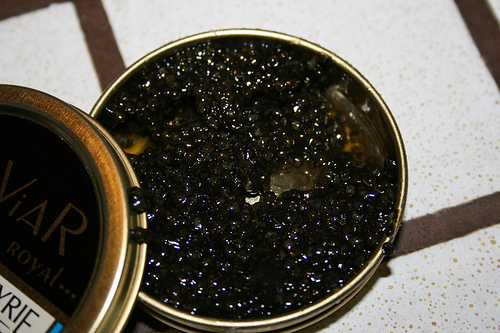 Most caviar will come from the Caspian Sea, which is bordered by Azerbaijan, Turkmenistan, Russia and Iran. When serving and eating caviar, experts recommend serving it on a plain base, such as a buckwheat blini and never use metal as this can give an “off” taste. Instead, use a pearl or bone spoon to keep the flavor intact. Plain crackers, a challah bread or toasted brioche, along with a dollop of caviar, can be a wonderful experience. Serve caviar in its glass jar on crushed ice and take out of the refrigerator at least 15 minutes before it’s being served.